VASER is the acronym of Vibration Amplification of Sound Energy at Resonance. As the name suggests, sound energy is utilized for liquefying the fat globules. After the fat is liquefied, it is then aspirated using liposuction. The procedure is done in a gradual but uniform manner. Compared to the conventional tumescent liposuction procedure, the procedure is more satisfying and comfortable. The advantages of the VASER technique are multifold. The method is gentler on tissues and fat can be suctioned even from areas that are difficult to access. The VASER technique is nowadays used mainly for obesity management. Mega-liposuctions can be performed more safely using this method. The technique used nowadays is a day-care procedure where the individual can go back on the same day of surgery. The patients can get to work after 3-7 days of procedure. Revision surgeries can also be done using VASER. 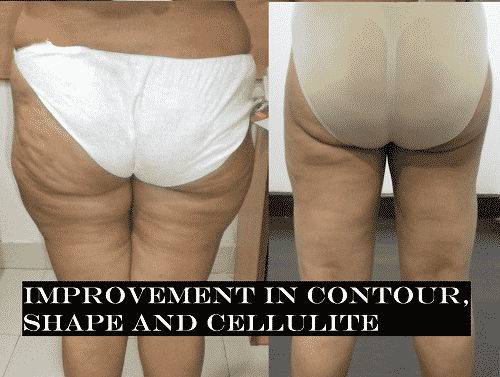 In this procedure, more reduction in cellulite can be attained due to a more uniform fat removal. 1. VASER procedures do not involve any bleeding. In contrast, the conventional tumescent liposuction involves making surgical incisions and is much more complex. 2. Megaliposuctions that involve removal of over 10 litres of fat can safely be done. 3. Skin tightening and tight contraction: The VASER technique facilitates the formation of collagen. This can lead to a tighter skin compared to liposuction. VASER is normally advisable for loose abdominal skin and thigh liposuctions. These are cases where the chance of sagging is very high. 4. Fat removal in difficult areas: Certain areas like thighs, female breasts, back regions, etc., are difficult in terms of removal of fat. VASER technique can be easily done in these areas. 5. Excellent body contouring and skin shaping. 6. Using a high definition VASER, a “six pack” appearance of the abdomen can be attained. 1. It is essential to wear pressure garments for at least 6 weeks. If swelling persists, they need to be worn for longer period. Tightening of these garments has to be done at least 2 to 3 times. Tightening has to be done after 1 week and then in the 3rd week. 2. Antibiotics are administered for 4 days. Painkillers are also given for 2 to 5 days. 3. Normal activities can be started from the 1st day after the surgery. 4. For reducing spasms and muscle stiffness, ultrasound therapy may be recommended in the 1st week. 5. For decreasing the swelling in the first three weeks, manual lymphatic drainage is normally recommended. Typical rest period after the VASER procedure ranges from 3 to 7 days. Depending upon the areas that have been operated, this time span can differ. If abdomen VASER is performed, the patient can return to his normal life after 4 days. On the other hand, it takes almost a week after a back and thigh VASER procedure. Procedure & pre-procedure workup: It is absolutely necessary to make the patient aware of the surgery. A primary consultation helps to understand the requirements of the patient. The suitable surgical procedure is finalized and its pros and cons are discussed. The measurements of the pressure garments are then taken and are subjected to various trials. After this procedure, pre-anesthesia check-ups are performed for analyzing the risk factors of anesthesia. Other tests like blood tests are also performed. During the procedure, the areas that are to be treated are marked. Anesthesia is then given and after this procedure, a tumescent solution is introduced. The steps for VASER are then performed. For avoiding any complications, great care needs to be taken. The required body portions are sculpted in the desired manner. The guidelines for using VASER technique have to be followed. Fat in the appropriate areas is suctioned. At the end of the procedure, the pressure garments are worn on the surgery table itself for obtaining superior results. Mostly, the patient is allowed to be discharged the same day of procedure. VASER functions on the basis of the energy of the sound waves for emulsifying fat globules. The sound waves are regular sequences of compressions and rarefactions. When high energy sound waves are made to pass through the fat globules, the compresses and rarefactions causes the fat globules to expand and contract. At certain point, the surface tension of the fat cells exceeds the maximum limit and the cells break and liquefy. This process does not cause any damage to the nerves and blood vessels. This property is referred to as the selectivity of VASER. This is also known as liposelection. The superficial fat layer of the body is subjected to VASER technique. The superficial layer is taken so that selectivity can be achieved in skin adherence to the underlying muscle layer. Special liposuction and vasering instruments are employed to achieve a six-pack appearance to the abdomen. Other procedures like chest muscle highlighting, defining the abdominal muscles, arm and back muscles, etc. Indications: VASER can be used in areas that have been previously treated using liposuction. Due to the liposelection property, difficult areas like thighs, breasts, back portions, etc., can be treated using the VASER technique. The fibrous tissue is subject to only minimum damage in this procedure. The recovery is also fast. 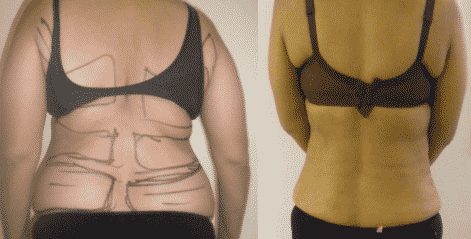 Even megaliposuctions like the whole body liposuctions can be performed in a comfortable manner. 1. It is to be kept in mind that body contouring is not the last word for a perfect health status, but is only the incentive towards a healthier lifestyle. 2. Proper diet measures must be initiated after the body contouring procedure. A consultation with a dietitian is mandatory in this context. Appropriate lifestyle changes must be incorporated. Activities like exercises, morning walks, etc., must be incorporated in the lifestyle. At least 40 minutes of brisk walk should be done for at least four times in a week. No long-term side-effects have been observed with this procedure. Therefore, the procedure is deemed to be very safe. There is a major doubt regarding the chances of future pregnancy, breast-feeding, etc. It is established that the VASER procedure does not cause any hindrance to these functions. 1. There may be swelling in those areas that are subject to VASER therapy. Swelling can be experienced for 7 days to 21 days. However, it disappears over a period of time. 2. Bruising may also be observed. This can fade away in the 1st week itself. 3. Muscle stiffness can also be observed, particularly over the back and thighs. This can be decreased with the help of ultrasound massages and treatments. 4. If the pressure garments are let loose, then the possibility of seromas to occur increases. 5. Fibrosis can occur; however, the chances of occurrence are very uncommon. Fibrosis appears as hard nodules or tight bands. This is an intrinsic response of the body. Ultrasound therapy and steroid injections are commonly used to manage this condition. 6. Hyper-aesthesia may also be experienced by certain persons during few weeks after the surgery. The condition usually self-resolves.